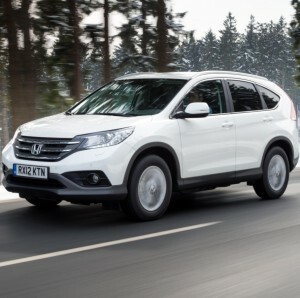 Honda are adding a new tax-cutting, small-capacity diesel engine to their CR-V range – making fleets the target market. The 1.6-litre i-DTEC engine already available in the Civic will adorn Honda’s mid-sized crossover from October, with 60% of customers expected to be business drivers. With a six-speed manual gearbox and two-wheel drive, the 1.6 diesel CR-V will have CO2 emissions of 119g/km – meaning road tax of just £30 a year. The new 1.6 engine is said to be the lightest in its class, weighing 47kg less than the 2.2. Overall the 1.6 CR-V is 116kg lighter than the 2.2, mainly through ditching the four-wheel-drive system. This has allowed the suspension to be retuned – improving agility and comfort – while the size of the brakes has been reduced without impairing stopping power. Available in three trim levels, prices are likely to start at around £22,500 – a whole £2,000 less than the equivalent 2.2. The new versions will further boost Honda’s CR-V sales, which have already enjoyed a 2013 surge following the introduction of an all-new model last year. In the first half of this year, sales of the 2.2-litre diesel model were up by 148% on 2012, while the petrol version recorded a 111% increase. Honda expect the new model to claim a quarter of all CR-V sales in the UK next year, boosting the total to around 17,000.